Marie-Thérèse-Charlotte is the daughter of Marie-Antoinette and King Louis the Sixteenth of France and lives in Versailles. Even though there is relative calm in her family circle, France itself is upset with the royal family. The people are starving and believe that the royal family doesn’t care for those that pay the taxes. Marie-Thérèse wants to go out into the city and see what being outside the palace is like. But she can’t do that on her own. Luckily she looks almost like a twin to Ernestine, a servant girl who lives at the palace. Marie-Thérèse and Ernestine switch outfits and Ernestine pretends to be the princess while Marie goes out to the city to see life for herself. Only the city is not what she expects it to be. People are not just angry, they want to do harm to Marie-Thérèse’s family and any other royals who stand in their way. If it wasn’t for the fact that Marie-Thérèse was dressed like a servant and that she met a nice boy named Henri she would have been in real trouble. Soon Marie-Thérèse and Henri are exploring all over Paris while Ernestine is playing the role of princess more and more. Understandably Marie-Thérèse and Henri soon fall in love while Ernestine falls for Marie-Thérèse’s betrothed. 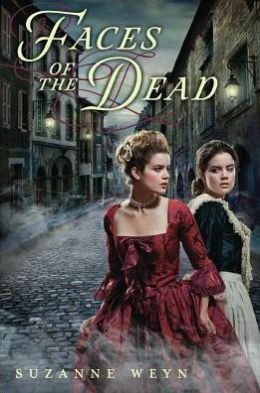 Then the French Revolution comes to a roar and Marie-Thérèse’s family order her and Ernestine to trade places to keep at least one member of the royal family safe. This book is basically 200 or so pages of drama with a French revolution background. Readers can guess from the first moment that Marie-Thérèse and Ernestine trade places (and thanks to who Marie-Thérèse is and when she lived) just where Marie-Thérèse would be when watching her family meets the guillotine. Of course her family is not what everyone says they are. Of course the revolution is one horrid bit after another. But the black magic? Really? Marie-Thérèse and her re-incarnated mother get to live happily ever after at the end (with loving Henri nearby of course)? And Ernestine escapes the horrid prisons and gets to marry her true love Marie-Thérèse’s fiancé? Those readers who thrive on drama with a historical setting will enjoy this book. But it was not written well enough to really tempt me. September 3, 2014 in book review, high school, historical fiction, middle school.